We arrived at midnight in Singapore Saturday night and were fairly travel weary, the heat hitting us like a hot wet fish in the face. There was only one thing to do… Grab some beers and food. Some delicious dumplings and spiral shells in chili (some said snails others say periwinkles). 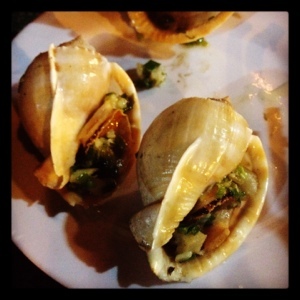 Down here in Mui Ne on the south-east coast of Vietnam they are quite the delicacy and are rather delicious!